You just never know what’s going to happen during your long training run for the Philadelphia half marathon! Philadelphia is one of the great row house cities in the United States, and maybe the world (we like to imagine it so, lol!). Certainly, there is a great diversity of row homes here, representing centuries of architectural styles. So, it’s easy to find great row homes while you’re out and about. Still, it’s always a nice surprise when you not only find a superb example but also have the owners invite you in, even though you’re sweaty and they have a party to prepare for. Meet Joe and Steve’s very elegant Greek Revival row house! Here, Joe is tending to his garden; just before inviting me in! What caught my eye in particular are the lush window boxes and the iron work around the parlor floor and entrance. A house from this period doesn’t have to have small-pane windows but it’s just a lovely touch, referencing the city’s rich Federal architectural past. I walked closer to get a better look and saw the door which is just beautiful! The iron work on the door is very cohesive with the railings around the window box. Joe said that the house used to be gray, pretty much inside and out. They decided to paint the 1896 Greek Revival row house a crisp white. Against the white, the green shutters contrast and punctuate the facade nicely. Most of the garden in the front is also green, giving a very coordinated face to the street. 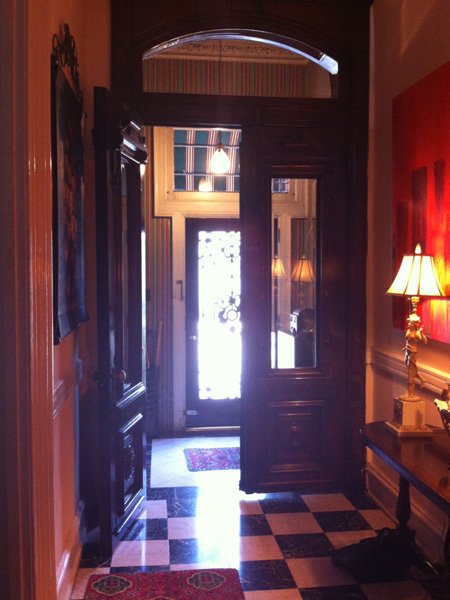 It’s a typical feature of Greek Revival row homes to have a small foyer leading into the hall. Like many houses in this style, the hall and stairs go along the side of the home. These entryways always have wonderful tile or wallpaper and this is no exception. Look at that molding! The window above the door would have opened, allowing for heat to escape. It’s always hard to capture the scale of a space but those are quite high ceilings. Here is the first look into the house. The owners have maintained the original layout of the home. Joe told me that when they bought the home in 1987, the owner had requested they keep the home a single dwelling and it remains as such to this day. He also mentioned that throughout the home, the molding is largely original. Turning around before moving on, you can see the foyer and doors from the inside looking out. One thing to notice is that the interior light is very muted. Although the house does have electrical lights (naturally!) and can be perfectly bright, the owners have plenty of indirect lighting options which creates a very period feel to the lighting in the home. After walking into the hall, to the right is the doorway into the parlor. Although having the door and the stairs on the left of the house leaves the house asymmetrical, once you enter the formal rooms, the elements, such as these windows, are symmetrically placed. Unfortunately, my iPhone doesn’t take the best photos when the room is dark and the windows are bright and sunny, so some of the details are lost. One thing to note is that when you have a parlor floor, or when the first floor of a home starts a few feet above street level, you can have lovely full-height windows without losing too much privacy to sidewalk traffic, except for curious runners. The back half of the parlor contains a grand piano which illustrates the scale of the room. Despite having plenty of space, you can see that this room multitasks as a formal parlor, library, and music room in true row house style. I’ve got better light in this photo so you can see the molding and plaster work on the ceiling. The red wallpaper fits appropriately with the original period of the home. Victorians were very keen on wallpaper, which was the fashion on both sides of the pond. Unfortunately, I forgot to ask if the wallpaper was based on an original design. Through the door is a small passage Joe that calls the gallery. The art displayed through the home is really an incredible collection and every small area holds a treasure. The home practically frames the art. Continuing on, the next room is the formal dining room. Again, the wallpaper is really on-target for the period. Joe said that when they purchased the home, all the walls were gray and all the trim was white. Although they agreed not to alter the layout, they did liven up the walls. Another really nice touch is the black and white marble floor. This is a very classic look found in many grand historic homes. Often, in a row house that hasn’t been overly renovated, you will see fireplaces. Joe says that there are two remaining working fireplaces in the house. Originally, this row house would have had two on each of the main floors and one in the kitchen for cooking. 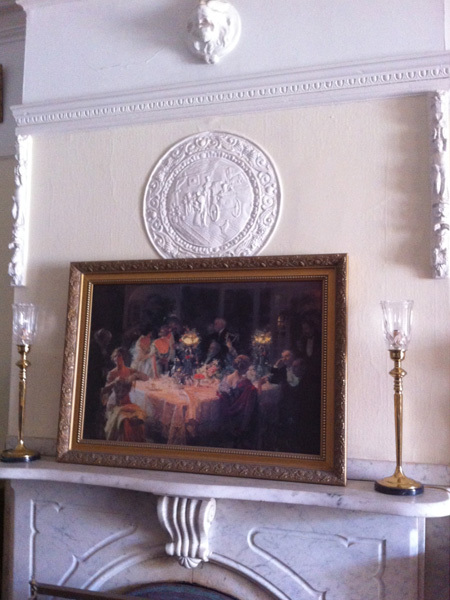 Below is the mantle of the dining room fireplace. The white and blue pottery is very complimentary of the wallpaper. There is nothing like built-in storage! Past the dining room is the kitchen which is quite lovely. However, Joe and Steve were getting ready to entertain and were bustling about so no photos. There was a finish on the window that, when the light and colors from the garden shone through, looked like the watery stained glass of a Tiffany window. Just outside the back door is an oasis of a backyard garden. These personal green spaces never cease to amaze me. Often, although not on this block, the streets don’t have any trees on them and look quite bleak. What happens behind the row homes often more than compensate. After visiting the garden, it was back through the house to progress upstairs to view the remaining public rooms. If I had a bathroom like this, I would never leave it. Thanks to all the reflective surfaces, this room practically glows – even without a light on. The windows are leaded stained glass and the light fixture, also glass, is just tremendous. Inadvertently, I’ve taken a selfie in my running gear. More of the fantastic bathroom. I have to say, I spent a good deal of time in the house going “oooh” and “aaaah.” My hosts were very patient and entirely gracious. Here, with the light on, you can get an idea of the reflective surfaces of the mirrored tile and the glazed subway tile. Dazzling would be the best way to describe it. Past the office area was originally a walled off area that served as a closet. There was paneling on the walls. One day, Joe shared, he drank a lot of coffee and, with a friend, pulled all of the paneling, as well as the wall, down. When they were done, they were left with a small room, overlooking the roof over the kitchen. His friend built wooden stairs, visible in the lower right corner of the photo, that lead up to french doors and out onto a roof deck. Here is another example of how the house frames the art. Here are the doors opened and leading out to the roof deck. Finally, I asked if this medallion was original to the house. Joe told me that it was salvaged from the home he grew up in, also an older home painted Quaker gray with white trim, that had been demolished due to fire. It is a touching tribute from one house to another. Walking through the house was like taking a journey. Everything has a story, from the house itself to all the carefully curated things within. Considering the Victorians themselves were master collectors, it seems quite fitting that Joe and Steve carry on that tradition. I can’t thank Joe and Steve enough for sharing their beautiful row home with us!